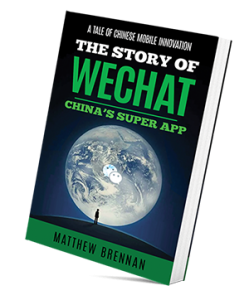 2 days ago, 688 million WeChat users either sent or received money over WeChat within a 24 hr period. 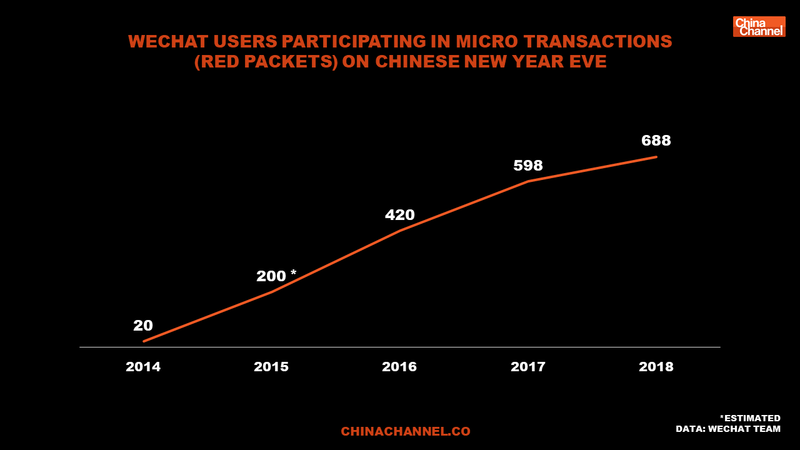 Below we bring you WeChat team’s official data infographic set for which China Channel was honored to be quoted along with the official data set. 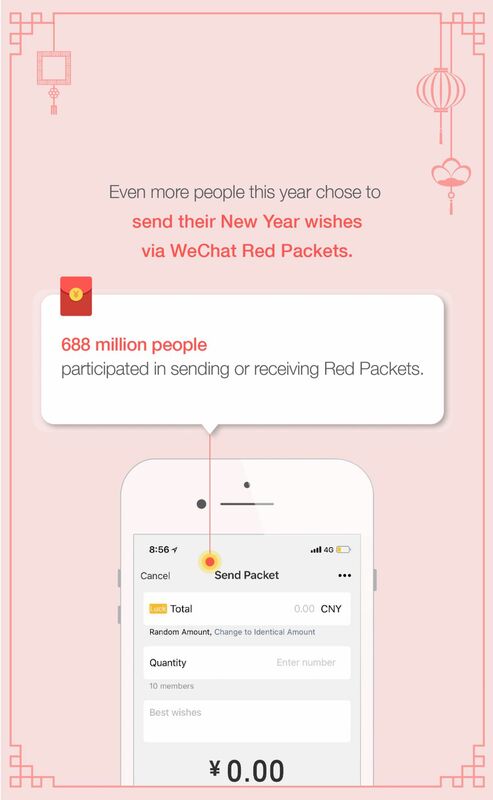 The total number of people participating in sending and receiving red packets was 688 million. An increase of 15% compared with last year. 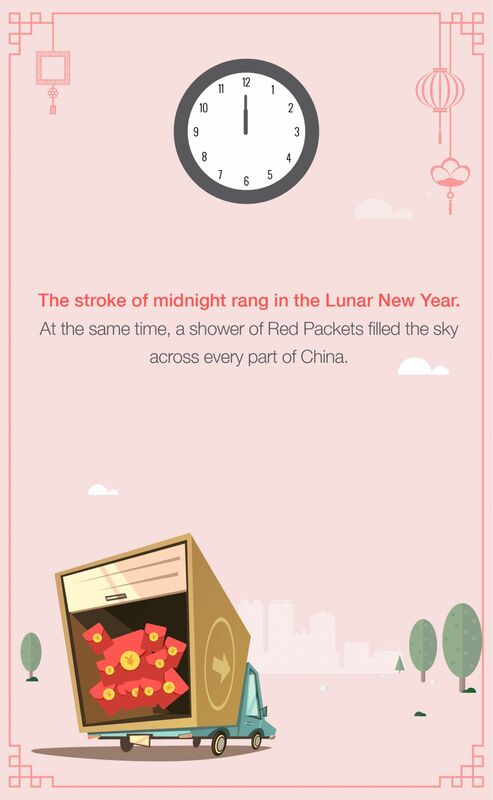 At midnight along with the sound of the New Year’s bell, red packets filled the sky making it rain across every part China. Users from the cities of Beijing, Chongqing and Chengdu were the most skilled and fast. They managed to lead the country in grabbing the most red packets. % sent by different age groups: Post-80s generation 32%. Post-90s generation (27%). Post-70s generation (22%). Post-80s generation (10%). Post-60s generation (6%). A woman from eastern Shandong province was the fastest, this Chinese New Year she received 1848 red packets. 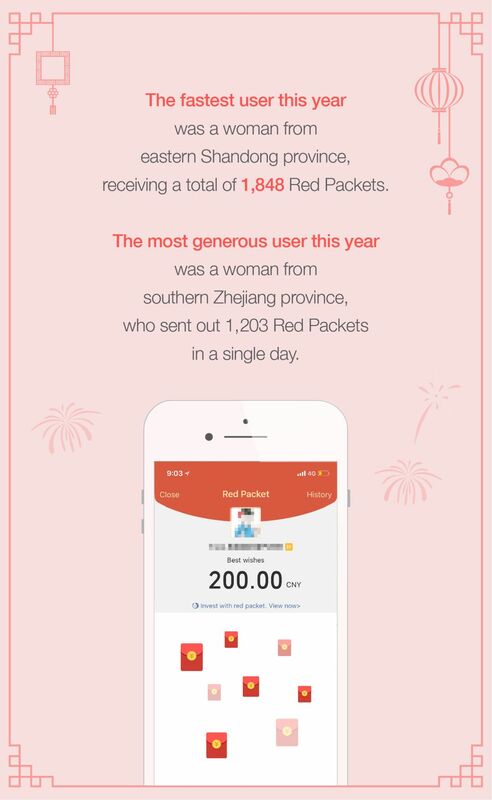 A woman from southern Zhejiang province was the most generous, within one day she sent out 1203 red packets. 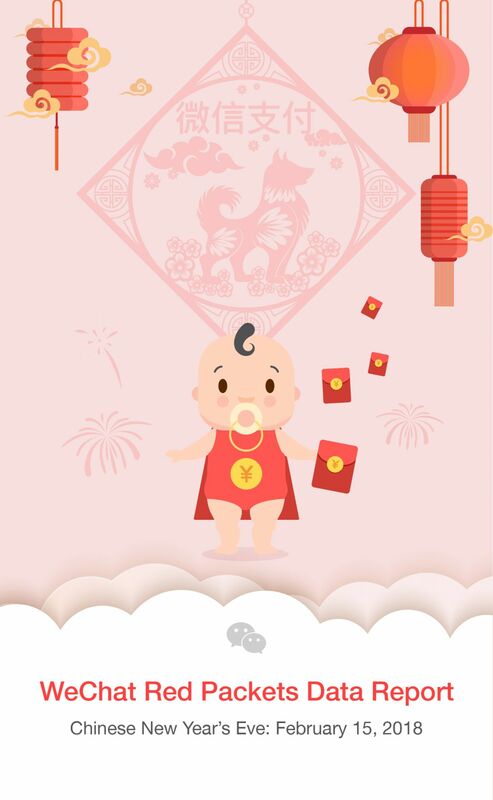 WeChat Pay provides Chinese New Year purchases with 5 star protection. 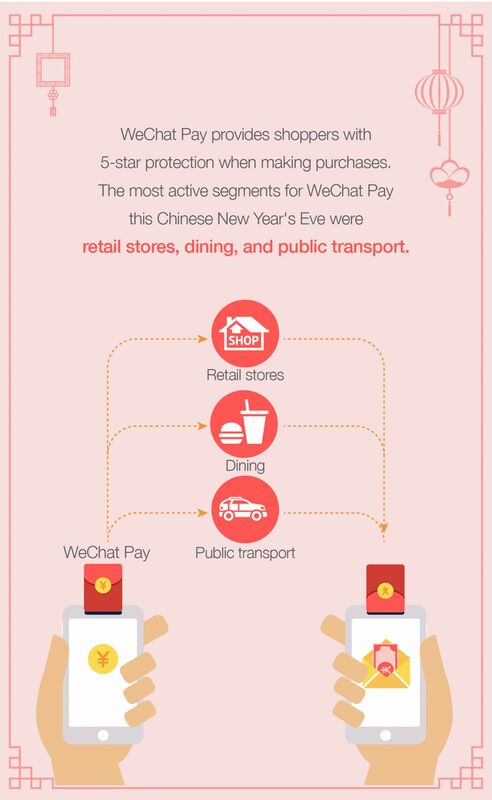 This Chinese New Year Eve, all across China people were active in retail stores, restaurants, and on public transport using WeChat Pay. 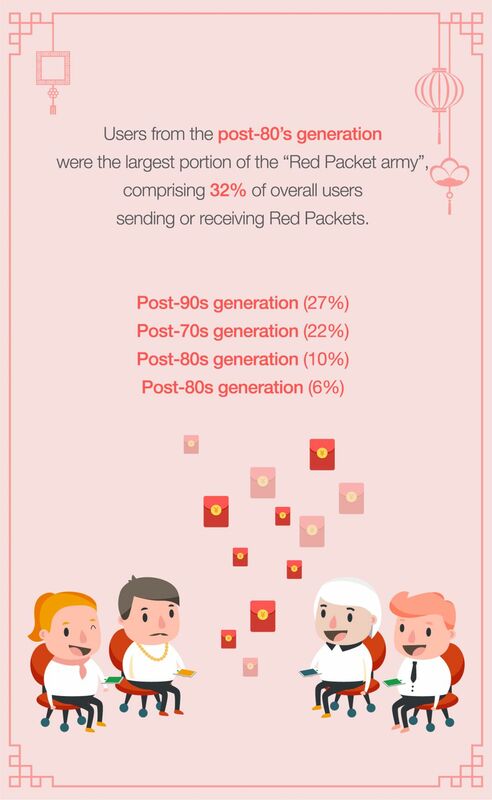 Over the past few years, the sending of WeChat red packets has become ingrained as a modern tradition of the Chinese New Year. 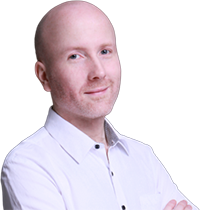 Mobile technology is shaping modern society and creating new forms of expression and ways to connect with each other. Red packets have the added benefit to merchants of recycling back money into the local economy. 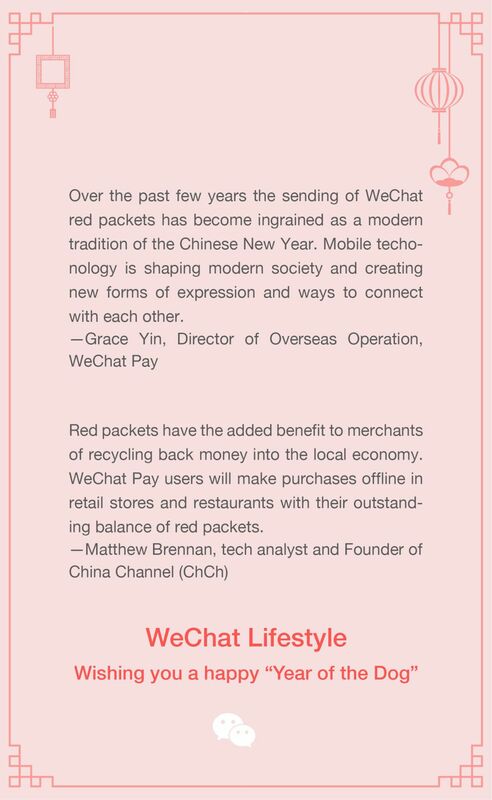 WeChat Pay users will make purchases offline in retail stores and restaurants with their outstanding balance of red packets.